Shoregirl's Creations: How Are You? 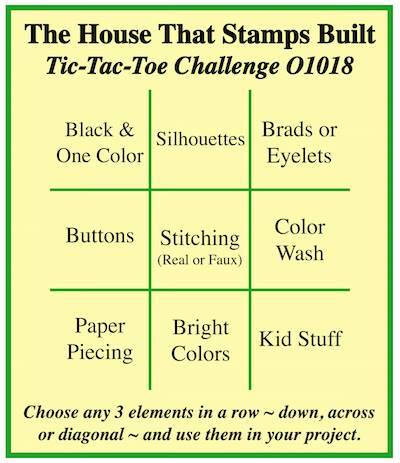 It's time for a Tic Tac Toe Challenge over on The House That Stamps Built. 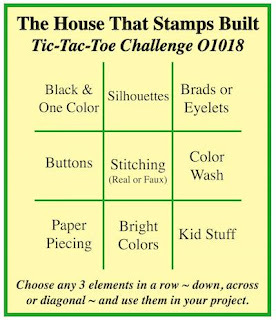 You know the drill...Choose three items (across, down, or diagonally) to include on your creation, then come by the blog and link it up! I chose the top row - Black & One Color (brown), Silhouettes, Brads. What a beautiful card - so much eye candy. I had to look a minute to se your leaf brad. I love how you always make the images go together. This is very appealing! I love the look, colors, and techniques used! What a stunning card Ester, you always pull so many elements together in such a striking way, such a talent! I really like how you did the leaf silhouette with the coloring and spritz of water - looks really cool! This makes me want to go for a walk in the woods...it's gorgeous! I love how you work the many layers and textures into your art, Esther. You're a master at this. Esther... love your fall collage! The leaf brad is sooo cute! Thanks so much for joining us at The Paper Players this week! This is fantastic. Thanks for sharing with us at CCCB! Another gorgeous leaf card, love the layering you have done on it, neat choices in the paper too! Another gorgeous card, Esther!! Love the vintage colors and all the texture you added. What a wonderful card! I love this look - the background writing is perfect and I love the color combination. Gorgeous card! I love all of the different textures with the backgrounds - it's such a great combination! Thanks for entering in the Dare 2B Artzy Fall Challenge.